DVR two television shows for the next six weeks. At the end of the six weeks, you may decide you don't need to watch that show anymore, or you can find time on a weekend to binge catch-up. Wake up 30 minutes earlier four days a week. 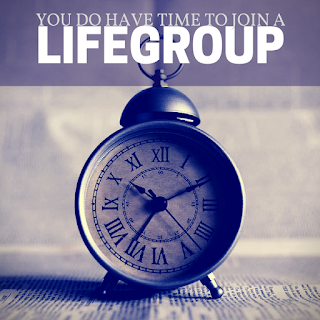 Organize your schedule to use that extra half hour each day to accomplish the tasks that keep you from being able to go to LIFEgroup. Your spiritual muscles are as important (if not more) than your physical muscles. You may not work out for two hours, but factor in transportation, cool-down, and clean-up as well! Cut out (or just reduce) your social media use. The New York Times reports that people spend an average of 50 minutes per day on Facebook. That amounts to nearly six hours per week. If you eliminate that time, you will be much more productive and may discover it is easy to invest two hours a week in spiritual growth. The purpose of this list is not to shame you into joining a group. It is to inspire you to be creative in finding SOLUTIONS that enable you to do something you know will be good for you. If you have other ideas for creating the time necessary to join a group, share them in the comments!